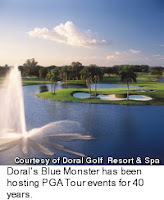 Tiger Woods dominated the World Golf Championship at the Doral's Blue Monster Course. It is the first time in Tiger's career that he has won the same event six times. It was the 56th PGA win of his career and he is fifth on the all-time winners list. Arnold Palmer had 62 career wins. Tiger takes home $1.350.000. Brett Wetterich, who was in Q-school just 15 months ago, finished second and had a very strong performance. Wetterich, who was in a Nationwide Tour event just one year ago, takes home $800,000. At one point in the final round, Tiger led by seven strokes. He experienced some difficulty though and by the 17th hole was down to only a three stroke lead over Wetterich.. On the final hole, Tiger had the shortest drive on the 18th of the day, by 30 yards. Wetterich had the longest drive on the same hole. Wetterich had a beautiful second stroke with a very realistic shot at a birdie on the hall. He missed it however. Woods bogied the 18th but it was good enough for the win. The course was difficult due to 20+ m.p.h. winds, the thick Bermuda rough and the bunker & water squeezed landing areas. Don Shula was the honorary chairman of the Doral event. The 13th hole was tough for the field. Only one player -- not Tiger -- had a birdie on the hole the entire day. Mark Calcavecchia needed to finish in the top 10 to go to The Masters and is hanging on by a thread. He started the day at seven on the list, but dropped as the round wore on. He had a quadruple bogey on the 18th hole, putting his ball --twice -- into the water. He made the top 10 finish and will be seen at Augusta.